You wake to the chant of the gulls and a faint light filling the sky. As you rub the sleep from your eyes, you catch a breath of sweetness - the smell of oats, milk and honey. Someone is busy in the kitchen or they’ve already been to the bakery. Either way you’re in for a treat! This adorable soap has a bee and honeycomb pattern which compliments the soothing mellow fragrance of oatmeal, milk and honey. The bar contains finely ground oatmeal which provides gluten and a delicate scrubbing power. Back in the warm cottage kitchen a new treat is waiting for you. For those who love the moisturizing and exfoliating benefits of our oatmeal scrubby, here is a new scrubby. This one is packed with the same great oatmeal as the original. It is shaped in an elegant swirl and fragranced with a true and pure almond scent. No syrup, no cherry, just almond, almond, almond! For those with nut allergies: may contain trace of almond. 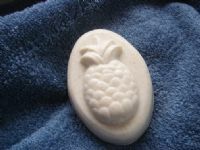 This charming example of our popular oatmeal, milk & honey soap shows the pineapple, the traditional symbol of "Welcome" throughout New England. When the seafarers returned home they would stake a pineapple on the fence by the front gate to signal that they were home again and welcoming visitors.